Seeing your favourite comic book characters brought to life is an exciting prospect, especially if they have previously been butchered on the big screen: we won’t mention the Sylvester Stallone Judge Dredd debacle of 1995. Online gaming software production companies are no slouches – they know how much we all love comic book superheroes and so they’ve produced gripping online pokies revolving around great comic book characters. Judge Dredd – the fictional American law enforcement officer who first made his appearance in the second issue of 2000 AD (a weekly science-fiction anthology), has been produced by the Sydney-based interactive gaming production company NextGen Gaming. It is a five reel, 25 payline pokie that offers players ample features and bonuses and has a minimum bet of AUD $0.25 and a maximum bet of AUD $100. Like the comic itself, the Judge Dredd online pokie has a dark, gritty, grungy feel to it. Judge Dredd offers a very unique option called the SuperBet. When activated, the SuperBet adds more Judge Dredd wilds to all five reels. I don’t need to tell you that any opportunity to boost the number of wilds added to the reels should be grabbed with both hands. There is also the ‘I Am The Law’ randomly triggered bonus which sees Judge Dredd randomly make an appearance and award an instant credit prize during any paid game. 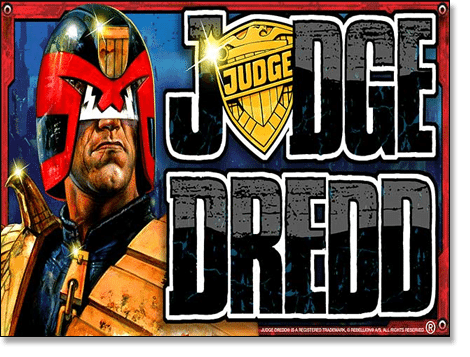 Any three or more scattered Dredd Badges triggers 10 free games. During your free games more Dredd Wilds will appear and all wins are doubled. Hellboy, a superhero created by writer-artist Mike Mignola, which has spanwed multiple films, video games, novels and animations, has been transformed in to a five reel, 20 payline pokie brought to us by those urban wizards at Microgaming. You can play for as little as $0.20 and a maximum of $100 per spin which caters to all punters. Like the comic, the Hellboy pokie is a dark and eerie experience into the supernatural underworld. During paid games, the Hellboy logo acts as the wild and pays double when contributing to a win. Super Mode can be randomly triggered during the main game. When triggered, the Super Mode awards 10 free spins with up to three sticky wilds added to the reels by Hellboy himself. Any three or more of Hellboy’s stone hand symbols triggers the Underworld bonus round. During the bonus round, you are transported to a screen with five doors which hide either one of your team-mates (who, if found, will award a credit amount as well as award all prizes behind the other doors), a monster (which will award a credit prize) or a blocked sign, which will end the bonus. There are up to five levels to traverse with an extra bonus if you manage to complete the entire bonus round. Hellboy is an exciting game on offer at trusted Microgaming casinos like www.Casino-Mate.com and www.RoyalVegasCasino.com. 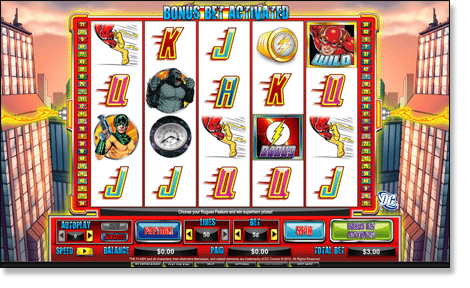 The Flash: Velocity is a five reel, 50 payline pokie developed by the NYX Gaming Group who have team up with DC Comics. You can start playing this classic for as little as $1 per spin and a significant maximum of $240 per spin – great for players on a budget, or those with deep pockets. During paid games, any wins with the wild Flash symbol can be boosted with up to a x3 multiplier, and the Speedster wild can be randomly triggered at any point during paid plays, too. 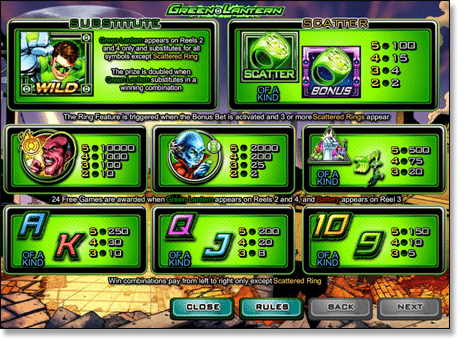 During the Speedster wild bonus, Flash will run across the screen, changing a number of symbols to wild Flash symbols. This game features an option unique to the Amaya/NYX/DC Comic range of slots: the bonus bet. The bonus bet is an extra 10 credits on top of your regular 50 credits spin. Once activated, the bonus bet changes the regular scatter into a scattered Rogue’s Feature trigger. The Captain Cold feature – when the Flash wild appears, Captain Cold may freeze a reel, making it an expanded wild for one spin. The Mirror Master feature – Mirror Master can replay the last four free spins at the end of any free game. Or the Grodd feature – where Grodd moves a roaming Flash wild symbol around the reels at random with each free spin. During the Rogue’s Feature the Flash wild can be up to a x5 multiplier. You can play The Flash: Velocity for free or real money at trusted casinos Slots Million or G’day Casino. Superman – DC Comics most successful creation and an American cultural icon, is one of the most widely loved and popular comic book characters of the last century, and his NYX Gaming pokie doesn’t disappoint. 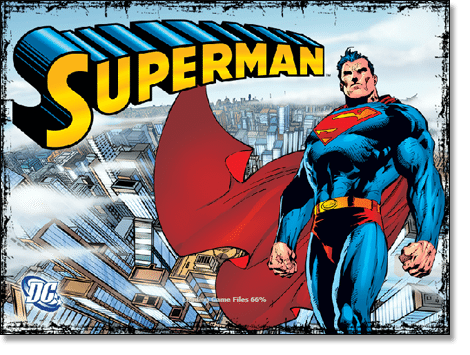 The Superman slot game is a five reel, 50 payline pokie with a minimum bet of $1 and a maximum bet of $240. Much like The Flash: Velocity, the Superman online pokie boasts a bonus bet which adds another ten credits to your bet and changes the Superman insignia from a scatter symbol in to a scattered Save the World bonus symbol. Any three or more scattered symbols triggers the Save the World feature, where Superman must fly through space blasting meteors with his heat vision. A group of hostages where you win credits for rescuing them. Lex Luthor, who you will catch and win credits. A room full of Kryptonite which will instantly end the bonus round. A 10 free-game feature can also be triggered by spinning three wild Superman symbols on reels two, three and four. During the free games, Superman flies around the screen before landing on a single reel with each spin. Whichever reel he lands on will then expand to cover the entire reel as a wild AND multiplier up to five times. Wonder Woman is a five reel, 50 payline pokie that has a minimum bet of AUD $1 and a maximum bet of AUD $240. As with the other DC Comics/NYX Gaming pokies, Wonder Woman also gives you the option of a bonus bet, which converts the regular Wonder Woman insignia scatters into Bonus scatters, any three or more of which are capable of triggering the Ares Showdown. Ares will send wave after wave of zombies to attack Wonder Woman. If Wonder Woman defeats all the zombies (collecting a credit prize for each one she beats), and then manages to hit Ares three times, you are awarded up to x100 your original bet. Any three or more Wonder Woman Wilds on reels two, three, four or five triggers eight free games. During the free spins mode, Wonder Woman can drop from the top of the screen and whip a wild onto the reels. That wild will then remain in place for up to five spins. All wins during the free spins are doubled. Play Wonder Woman for free or real cash at www.EmuCasino.com. Last but not least, and my personal favourite, is the Green Lantern online pokie: a five reel, 50 payline slot from NYX Gaming. You can play Green Lantern from as little as $1 per spin and a maximum of $240 per spin. Based on the fictional character Hal Jordan (aka the Green Lantern), this slot game (unlike other NYX/DC Comics games), has stacked Green Lantern wilds on reels two and four. Not only that, but any winning combination with a wild doubles the regular win. The bonus bet changes the ring scatter symbol into the scattered ring duel trigger, and when three or more ring symbols are spun, you’ll find Green Lantern in a duel with Sinestro. If Green Lantern manages to beat Sinnestro in the epic battle of the rings, you can win up to x100 times your initial bet. Don’t worry though, even if you don’t beat Sinnestro, you are still awarded cash credits. 24 free spins are awarded when the Green Lantern symbol appears on reels two and four, and the Battery symbol appears on reel three. During free spins, Green Lantern wilds boost wins by x4. Each Battery symbol that appears adds an extra Green Lantern to reels two and four during the free spins feature. You can play Green Lantern in fre play mode or real money mode at Slots Million. Like comic book hero slot games? You might also enjoy Net Entertainment’s pokies adapted from blockbuster movies, Microgaming’s Hollywood film based slots as well as TV series which have entered the realm of online gambling. For these slot games and hundreds more, we recommend checking out Raging Bull Casino, our top-rated casino site for players from United States, which has some excellent welcome bonuses available for new players along with hundreds of real money casino games to choose from, with no downloads required.